Beer has a wealth of flavors. It is made in (and imported from) all over the world, and there are sophisticated beers from boutique or micro breweries that have developed their own unique flavors with locally-grown ingredients. “Alcohol boils at 172 degrees, so any cooking you do with any kind of alcoholic beverage won’t leave any alcohol in the food once it’s done. It all evaporates off early and fast. So, you can serve/use any of these recipes/techniques for the whole family including kids and others who may be sensitive to such things. Plus, there’s not that much alcohol in beer to begin with; it’s mostly water. The tricks you see in some food presentations where they flambé things (French for “set on fire”) only work if they pour concentrated alcohol (usually brandy) on right at your table and light it immediately, and you’ll notice it goes out very quickly as the fuel is consumed so fast. Beer-Can Chicken is one of those odd inventions that seems to have developed a life of its own. The basic premise is to stand a chicken up on an empty beer can and cook it standing up. For beginner cooks, I would rate the “Degree of Difficulty” on all Beer-Can Chicken recipes as “med-high,” as most involve firing up a barbecue grill in addition to preparing the chicken. If you don’t have a barbecue, you can make beer can chicken in your oven. Cooking for Engineers shows us how to make Smoked Beer-Can Turkey. This recipe would be a fabulous change of pace for Thanksgiving dinner! 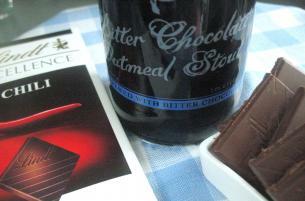 Chocolate and chili sounds unusual but it’s quite a popular flavor combination. Jen has what looks like a fabulous Chocolate Stout Chili photo-tutorial that is also made with jalapenos. If you know how to brown beef, chop an onion, cut jalapenos, and mince garlic, this recipe is for you! Sausage cooked in beer is easy, quick and delicious. Beer breads are generally described as “quick breads” as they use baking powder or baking soda to rise instead of yeast and take a lot less time to make. I did an Irish Bread video that is also a quick bread. Have a look at that video to see if quick breads are something you are ready to tackle. 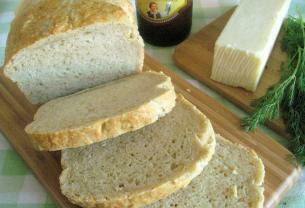 The ingredients for beer bread are simple; flour, sugar, salt, baking powder, and beer are the basics. You can then add all sorts of herbs/cheese to fit your taste. Farmgirl Fare has a really good basic recipe called Beyond Easy Beer Bread Recipe: A Warm Crusty Loaf In Under An Hour. She also gives all sorts of variations including adding shredded cheddar cheese and dill, or garlic and herbs, or rosemary and feta cheese, etc. Epicurious has a really simple recipe using just the basic ingredients as well. They use 3 Tablespoons of sugar whereas Farmgirl uses only 1 Tablespoon of sugar. Neither recipe specifies what kind of beer to use, which is a pity. As with all baking, measuring must be precise! 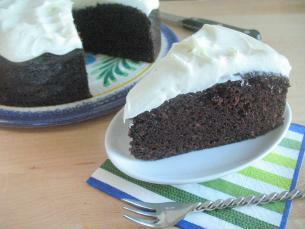 My Chocolate Cake For Beginners is made with Guinness. If you have used beer as an ingredient in the meal, you may want to serve that beer at your dinner party as well. I would like to stress that I am not a beer drinker. I do hope that some of my readers that have had experience cooking with beer will jump in and help with any questions or comments. **I would also like to thank Kevin Wagner for inspiring this post and Jessica Howard for her input! You are absolutely correct that the soup was a big part of falling in love with Vermont. We found Vermont to be extremely lovable, and the food was amazing. I was worried that the recipe was a bit too complex / gourmet for people to try (I honestly don’t know many cooks who have ever carmelized onions). I don’t know if you noticed, but to help out anyone that wanted to try the recipe, I linked to your tutorials on chopping and carmelizing onions. I hope they make the recipe less intimidating! I really appreciate all of your step-by-step tutorials. They are one of my favourite parts of the site. We’re going to be trying to include recipes for regional specialty foods that we try as we travel, and I look forward to linking to your tutorials for all of them. 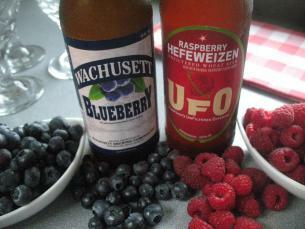 I bet you can’t guess the recipe we’re using for Massachusetts…. I’ve never been a fan of beer at all, so I was really pleasantly surprised at how much I liked a soup made with it. It always pays to try new things, doesn’t it? When I have a kitchen again (one day!) I’ll look forward to trying out all the good-looking beer recipes here. And Neil certainly won’t complain if I serve them for breakfast. Thanks KGW for the quotes! After having sampled that raspberry beer, I could not agree more! Shaula I am actually one of those people who does make caramelized onions! They are not difficult, just time consuming. I am dying to try that Cheddar and Ale soup recipe. I am not a beer drinker either but I do find in recipes it adds a depth of flavor that just can be duplicated by another ingredient. I am looking forward to hearing all about your culinary adventures as you cross this great country! Does anyone know why we don’t put ice cubes in beer? Ice cubes in beer makes it release its carbon dioxide early, so it’s liable to feel flat before you get a chance to drink it. 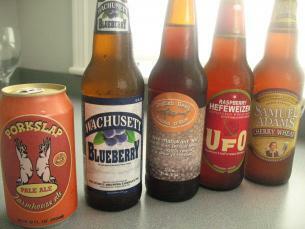 Plus, most beers don’t tolerate dilution well, especially mainstream American beers, which are pretty weak to begin with. That must be why I like ice cubes in my beer! Thanks for the link on the Beer and Brats recipe. I try to share all my beer cooking recipes, so hopefully you’ll find more that you enjoy. Having made quite a few batches of beer bread, my opinion on beer selection is to stick to malty beers, and avoid bitter and/or hoppy beers, as those flavors seem out of place in the finished bread. The batches I have made with a robust, roasty, bitter stout and a hoppy, bitter IPA were really not that great, I’m not sure we even finished eating either loaf. Typical macrobrewed american lagers (bud, coors, pabst, etc), while they may be a bit bland and boring to drink, tend to do well in beer bread – their simple, crisp maltiness lends a good “beery” flavor to the bread – and it’s a great way to get rid of some cheap beer someone left in your fridge after a party! Mario, your recipe looks really (really!) good! Thanks for the updated link. Evan, I made the bread (photographed above) with Sam Adams Ale and whoa! The whole house had a yeasty-beer aroma. The bread had a very distinct flavor which I did like but many would find a bit too strong. Next time I will take your advice and try making it with a lighter beer. Frankly, I haven’t heard that beer can be used in cooking. But, I’d love to try a plate that has beer flavor. Usually, I like drinking beer when I go out with my friends and the idea of having beer in my food sounds delicious. Hi Kathy. 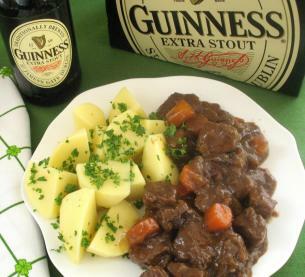 One of my favorites is Beef and guinness pie. So delicious. I have a friend who’s Irish and nothing tastes better than the real deal from a real Irishman.